It’s most certainly barbecue weather now in Nova Scotia. The weather has been very warm (for us) for a while so perhaps you should plan that barbecue for this coming weekend now. 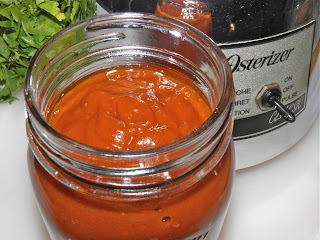 I posted a chipotle barbecue sauce earlier that is bursting with spicy flavour. But I know that not everyone is brave/stupid enough to enjoy chipotle. So it behooves me to post an alternative. 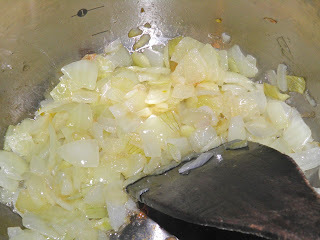 Sauté the onions and garlic until the onions are translucent. Here it is. 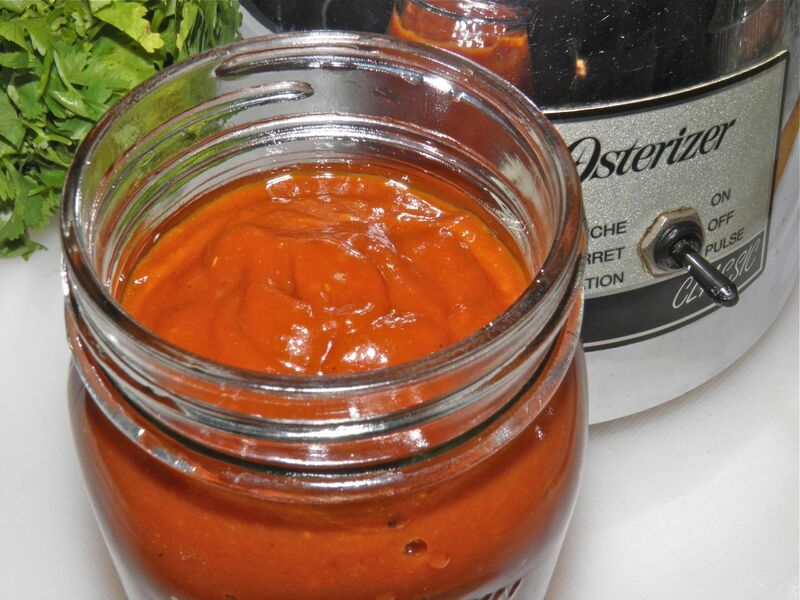 This homemade barbecue sauce is ready to use in less than one hour. The flavours are interesting yet not overpowering and impart a nice gentle taste to beef, pork or chicken. I should also say it would work on tofu "steaks” (blocks cut in half lengthwise) as well. If you've never barbecued tofu you should. It's great and lets you invite your vegetarian friends without them feeling left out. Pre-flavouring tofu steaks by studding with garlic is advantageous, and oil the grill before placing the tofu pieces on it to minimize sticking. Then use the sauce as usual. I'll post a tofu steaks recipe another time. This sauce doesn’t have as high a sugar content as most barbecue sauces. This is an advantage because it can take more heat without burning. I would still suggest broiling on medium high heat, just to be on the safe side. Burnt crispy barbecue has an increased level of carcinogens. 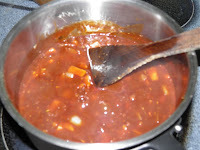 This is a “fusion” sauce, meaning that flavours are taken from both Asian and European cuisine. Fusion foods deliver unusual and pleasing combinations. Such is true with this recipe. Cook down for 30 minutes. 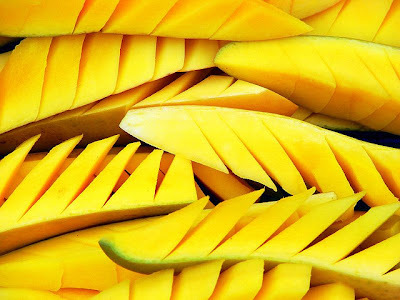 The addition of mango increases the sweetness over what this would be without it, and also is another Asian slant on this delicious barbecue sauce. Since I wasn’t sure how much propane the barbecue had left I did the steaks under the broiler. My one inch thick steaks took 7-1/2 minutes per side, and then were baked in the oven at 375° for 10 minutes to finish them to 170°F internal temperature. They turned out perfectly cooked, still moist inside after broiling and baking. As with all homemade barbecue sauces, you should only keep leftover sauce for one week in the refrigerator. This is because there are no artificial preservatives. This recipe makes 1 pint (2 cups) so I would hazard a guess that you would have more than enough sauce to barbecue for quite a sizeable crowd. Here’s a tip. 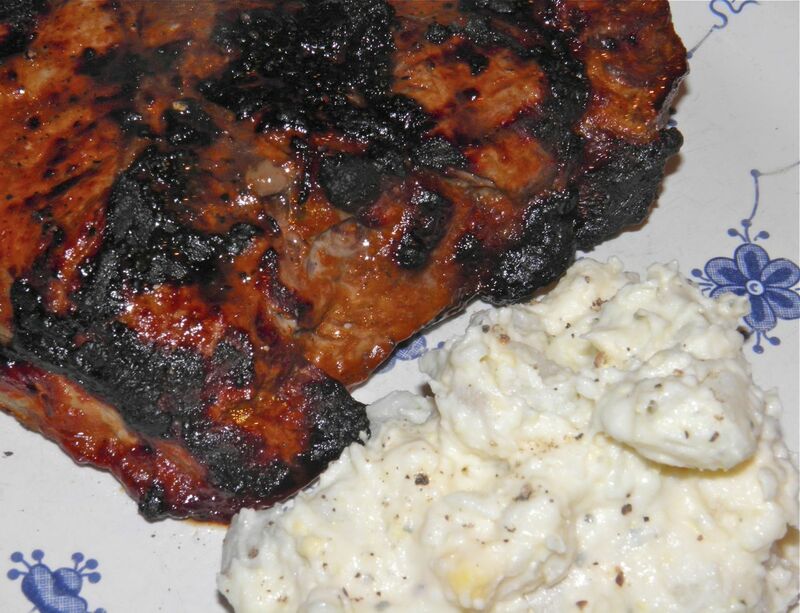 If you find your barbecue sauce burns before your meat is cooked as you wish, you can do one of two things. Either apply your barbecue sauce on partway through grilling or broiling, or do as I did and finish them in the oven. This sauce is a bit on the mild side. If you wish you can easily double the cumin, cayenne, thyme and black pepper. The sauce after being puréed. This picture is darker than what the steaks were. I swear. Place a large saucepan on a low heat and gently fry the onions and garlic in the vegetable oil until onions are softened and slightly brown. Add the remaining ingredients. Bring the mixture to a simmer and cook uncovered for half an hour. Stir frequently to avoid sticking. Remove from the heat. Let the sauce cool and then purée in a blender or food processor until smooth. Use immediately or refrigerate for up to 1 week.